NEEDHAM, Mass. — TripAdvisor has compiled a list of the “21 Best Tropical Vacation Destinations Around the World,” and according to TripAdvisor Content Marketing Specialist Ashlee Centrella, St. Kitts and Nevis are featured on its list. “Tropical getaways are what vacation dreams are made of. Swaying palms, powder-fine sands, and clear blue waters—what’s not to like? Well, stop dreaming and listen up! “Tropical” doesn’t have to mean prohibitively expensive: booking a rental home can make that tropical daydream a reality without blowing your lodging budget. With a rental property from TripAdvisor, you’ll have the advantage of more space, added privacy, and maybe even your own backyard or beachfront! Cocktail under a palm tree, anyone? “The best tropical vacation destinations stand out for their natural beauty and also for the range of activities to help visitors make the most of their getaway. Our round up includes locations particularly recommended for activities like deep-sea fishing, scuba diving, rainforest hikes, city tours and gentle cruises. “These 21 breathtaking places are among the best tropical vacations in the world. How many have you visited? Warning: Your wanderlust wish list may get a little longer after reading this round-up St. Kitts and Nevis highlighted. “The double-island nation of St. Kitts and Nevis offers historic plantation homes, fantastic views, fresh seafood dishes, and welcoming drinking holes stocked with local rums. “To get the best out of your visit, pre-book an island tour of St. Kitts, including a shopping stop and a visit to Brimstone Hill fortress. You might also like a three-hour scenic railway tour,” TripAdvisor says. TripAdvisor features links on its website to general information and makes special mention of tourist attractions. “Discover the wealth of fascinating sights on Saint Kitts during this 3.5-hour excursion covering history, shopping and a chance to explore the island’s incredible scenery,” TripAdvisor says. “Enjoy some retail therapy during a stop in Basseterre, the island’s capital city, and then head to Romney Manor, the home of the island’s Caribelle Batik plantation. You will also check out the picturesque Brimstone Hill fortress and have time to admire the towering Mt. Liamuiga, a 3,792-foot (1,156m) extinct volcano. Your St. Kitts excursion also includes a guide and round-trip transport from your hotel. See all that the diverse island of Saint Kitts has to offer as you take in some of its best shopping, historical sites and natural attractions during this half-day tour. This excursion is a great way to get a sense for this unique Caribbean island’s wide variety of attractions, both natural and cultural. TripAdvisor recommends an island tour with Tropical tours and gives it five stars. The tour takes three-and-a-half hours with a guide and shopping stop. It includes a scenic coastal drive to Romney Manor, home of the Caribelle Batik. “Start your day with pickup from your Basseterre or Frigate Bay hotel, leaving at either 10am or 1:30 p.m. depending on the option you’ve selected. Then proceed through St. Kitts’ capital city on your way to the day’s first stop for shopping. During your retail visit, take time to admire the historical architecture of this fascinating city, known to be one of the oldest in the Eastern Caribbean and home to such landmarks as Independence Square and St. George’s Anglican Church. “Depart from Basseterre as you proceed to the day’s next visit at the Caribelle Batik, situated at Romney Manor. Take some time to explore this former sugar plantation at your leisure, making sure to stop by what are likely the most beautiful gardens in all of the Caribbean. “Head next to Brimstone Hill Fortress National Park, home to some of the best-preserved fortifications in the Western Hemisphere. Wander this historical site on your own, learning about the role of the various Dutch, French, Spanish, English, American, Carib, Amerindian and Arawak cultures that have called this area home. Please note that admission to the fortress is $8. “Continue on a scenic drive along the island’s scenic palm-fringed northeast coast, swinging past Dieppe Bay where the Caribbean Sea and Atlantic Ocean merge at the Black Rocks. “Check out the sleek black cliffs formed by centuries of erosion and admire the towering peak of Mt. Liamuiga, the 3,792-foot (1,156m) extinct volcano. Then head back to Basseterre or Frigate Bay for a drop-off at your hotel. “Climb all aboard a luxurious rail car for a 3-hour train ride through Saint Kitts, offering the first scenic railway in the Caribbean. Journey 30 miles (48km) on board your opulent rail car, outfitted with an observation deck, complimentary drinks, air conditioning and large windows to guarantee prime views. “As you travel, listen to a fascinating historical overview of the Caribbean before finishing with a sightseeing coach tour covering 12 miles (19km) of the island’s key attractions and landmarks. Your train ride also includes round-trip hotel transport. “Take a luxurious train trip through the island of Saint Kitts as you travel along one of the Caribbean’s first scenic railways, finishing with a coach bus tour of the island’s key sights. “Whether you’re a train lover or simply looking for a unique way to explore this tropical island, this train excursion is a great option,” TripAdvisor says. “Start your trip with a pickup from your Basseterre or Frigate Bay hotel at 8a.m., continuing to the train to begin your ride. “The sumptuously-appointed rail cars feature a range of amenities, including beautifully-designed interiors, a full-service bar and bathrooms. The car’s upper level features a viewing platform where you can enjoy unobstructed views of the island’s soaring mountain scenery and thick, green cane fields. Meanwhile, down below on the lower level you will enjoy air-conditioning and sublime views through the large windows. You will also be able to pick from selection of included beverages during your ride. “Watch as your train pulls out and begins its journey winding its way along the edge of Mount Liamuiga. “As you travel you’ll be able to see a variety of scenery like secret black sand beaches, the ruins of decaying plantations and sturdy iron bridges (one of which spans more than 300 feet (90m) over a large valley). The train also passes through a number of towns on the way, including Saddlers Village and Mansion Village, flanked by fields of fruit. “Listen as you travel to commentary about the island and your route, hearing tales like about the “Last Railway in the West Indies,” a train that was used to transport sugar cane from the island’s plantations to its main sugar factory in Basseterre. 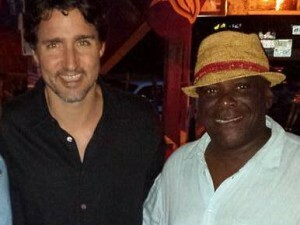 You will also be serenaded with catchy folk songs and tunes performed by the St. Kitts Railway Choir. “Upon finishing your scenic train ride, climb aboard a sightseeing coach for a 12 mile (19km) tracing Island Main Road. Among the sites you will pass are Brimstone Hill Fortress and a number of small towns and villages on the way back to Basseterre. 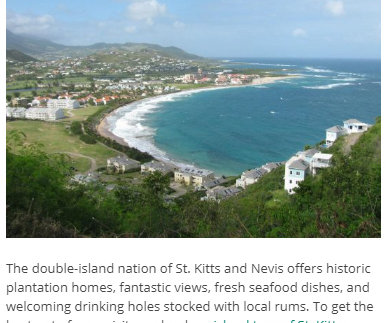 TripAdvisor goes on to rate numerous other attractions, restaurants and hotels on both St. Kitts and Nevis.